The most important path for a stable career in one’s life is decided during their college years. It is a part of life where most of the students decide what they wish to do in their future and their careers. Even though it is crucial part of life, mentally most students often tend to be little lethargic as well as it is the age where various situations do not allow them to be their best because of various distractions around the society as well as personal life. In spite of these distractions, college students who are very studious as well as well planned come out with flying colors and lot of dreams in hands. Learning how to study can be tricky and hard for most students, if they are not well prepared. But with proper discipline in studying and lots of hard work, one can easily tackle the various distractions that occur during their student life. Here are a few tips and tricks that will help you to perform better and also help you to pass your final exam with a great performance. Getting a good score in final exams or being a best performing college student does not happen in a day. There are few disciplines which needs to be followed every day, few disciplines regarding the involvement in classes and assignments, and few more disciplines which has to be followed during exams. These various tips are categorized into three sections. How to Memorize Every Day? This is the most common tip which is very effective not only in college but wherever you go. The art of taking notes not only will help you to improve your listening skills but will also help the students grasp the contents quicker as well. One of the effective study habit is to write notes for all the subjects either during the lecture or take some time to write notes after your lecture hours. Try to grab the keywords of the session so that you do not end up writing pages. The whole concept of writing notes is not to miss out any point in the topic taught during the lecture. If you feel that you have missed some points then feel free to ask the lecturer about it. The key in taking the best notes lies in how well the student knows their subject. Try to take notes that are thorough and accurate. This will help you to be more familiar with the topic and the material while rewriting these notes into a fair material. This is another very important study tips and tricks. Do not miss out any study sessions or lectures. Whatever might be the case, you feel the sessions sound boring or neither interesting, you need to be present as sometimes you will learn things better either by your staffs or some students who understood it better. Surroundings help you in some way or the other. Be punctual to feel responsible and to study well. Try to be involved in classes and try to understand what the professor is teaching. If you feel that the professor is moving fast with his subject, then feel free to inform him that you are not able to follow. Also, ask doubts and questions if you feel confused or lost. Clearing doubts is a best way to study effectively and clarify your questions at the same time. You might have bundles of notes or any flyer’s which has potential content to be saved. So, never forget to organize you study materials. Try to note down in notebooks or in case when you write down in loose sheets do not forget to file the study materials. Make it a habit to organize every day your study materials which you used on the same day. Organizing class materials is one of the most important qualities that a college student should have. Make sure that you use office stationery such as sticky notes, highlighters and post-it notes to remember various textbook pages, try to save your assignments and also make small organized notes that will help you to remember important terms and words. All these will be of great help to you during the final exam. Finish your subjects day to day might be sounding childish. But that is the best way ever and one alternate is you can at least try to recollect whatever subject contents you have learned through the day. Recent survey tells that the best method of retention is to review your subject within twenty four hours of hearing. Studies have shown that by trying to review lessons on the same day when they are taught, enables students to remember more than half of the material. Hence, reviewing lessons each day can do wonders for your memory and also the retention of the material in one’s mind. Also, recollecting the taught materials every day, can enable you to identify any mistakes or omissions in your notes and materials and helps you to be prepared better for the final exams and tests. Most of the students misunderstand that most of the lessons are taught and spoon fed to the students. But in reality, it is the opposite. Always remember that you are there to learn. You pay for your education and the teachers do not pay you for hearing their lectures. Always be involved and push yourself to focus on your studies every day because you are the one responsible for your outcome in your career and education. Take responsibility for the money which has been invested on you and your tuition. While attending college we might notice that almost all the students have different levels and capacities of hearing and understanding. Not everyone can grasp and understand everything after one lecture. Such listening skills come by habit for many. If you feel that you are lost and you are struggling to understand the concept of the lesson, then do not hesitate to ask questions and doubts to the lecturer. Always keep in mind that it is better to ask help from lecturers rather than being ignorant about your doubts. Try not to ignore important doubts as these doubts may prove to be a problem for you in the future, especially while studying for exams. Make sure that you ask as much as you can from your lecturer and clarify and learn from those doubts, if possible. Take your time, do some research work and present it at your best. Remember your content will speak for you only if you present it a neat manner. Use proper font size and spacing or if you have been asked to write make sure you keep it legible to understand. Also, if you fail to submit your assignment after the due date, most lecturers won’t even bother to take a look. Make sure that your assignments and assigned work are perfect and they meet the standards and requirement set by the lecturer. This will also create a good impression about you to the professor and can help you earn a good image. How to Study for Exams in One Day? Exams are always considered as something very crucial or something that is been seen as a judgment day for our entire skill set or intelligence. Yes in some way it judges your potential but this judgment is not for college or for staffs. It is for the self. We should take exams as a parameter for self realization and not very intimidating process. Here are the few study tips for students to excel in your exams. Do not inculcate the methods of studying a day before the exam. It is often misunderstood that the concepts stands better in the memory a night before than reading out earlier. This is not true at all. Reviewing your notes everyday will be a bit time consuming, but it will work wonders at the end, during exams. Try not to cram too hard a day before the exams. Remember when you are burning midnight oils before night of the exam no concepts gets into you as you merely read for marks and not knowing the concepts. There might also be a risk of forgetting everything that you have learned by studying all night. Make it a habit to expect anything that might be included in your question paper. Never expect a few patterns and prepare in that way and get disheartened. Examiner’s have all right and authority to test you with any kind of question patterns. Do not try selective study methods as this might have a chance of backfiring back at you, and in the end you might end up with questions that you had omitted . So, prepare from all aspects to face whatever the style questions might have been asked. When you are preparing for an exam, always go through your notes and do not be completely dependent on your text books. For example, you might have highlighted few topics which are very important in your notes. So, do not miss important topics and learn according to the most important priority topics. And also in this case, do not leave the least important without glancing it as anything can be expected. Also, to make your notes more interesting and easy to study, try to include diagrams, pie charts and graphs to help you understand the topic even better. One of the most important study skills that you should have is to get prepared physically and mentally for the day. Arrange your exam essentials, your hall tickets the previous night of the exam to avoid getting nervous on the d -day. Also, try to have a good night’s sleep, as this helps in improving your memory and concentration. Never lose confidence or never consider yourself weak on few subjects just because you are not able to perform well. There are no parameters that can judge an individual’s ability. So, take exams for self analysis. Always have a systematic behavior from day one to achieve better results. Another important factor that you should keep in mind is to never miss an exam. Missing an exam has its own serious consequences associated with it. Try not to miss an exam just because you hadn’t studied properly. This can cause further problems between you and the lecturer and in the worst cases, disciplinary actions might also be taken against you. Above all, presentation is equally important along with studying your subjects. Try to present your best by having a legible handwriting, neat diagrammatic representations and highlighting important topics etc. Getting yourself educated is very important any day for any individual. Do not underestimate your capability by the mistakes that you have committed previously. 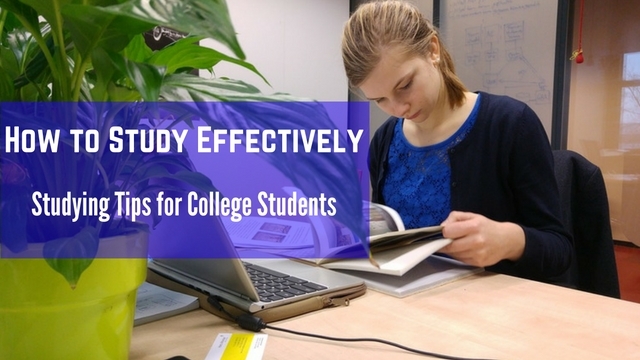 Follow these simple tips for studying to excel in your college life.